If you live in Boston MA and surrounding area and looking for a reliable Mobile Notary service, look no further than Neighborhood Parcel. Our staff is knowledgeable of all Massachusetts Notary requirements and will come to your house, office, Hospital and Assisted Living locations to conduct notary. If you or your loved one are unable to travel, our mobile notary service is great for you. It is a small price to pay for the convenience and time savings. 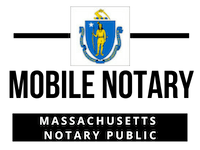 Notary Publics in Massachusetts will often refuse to notarize documents in Arabic or any foreign language. Lucking, our Notary Public does speak and write Arabic and will be happy to Notarize your Arabic Documents, perform is a signature witness, Administer Oath or Certify a copy of your Arabic documents. Our service provider makes house call visits and can also come to your office to perform the Notary seven days a week and after hours.